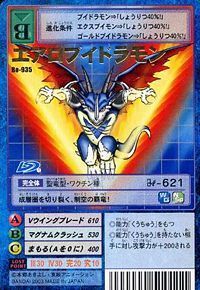 V-dramon evolved further, and as Aero V-dramon, it became able to move through the sky. Among the rare species of V-dramon, it is said that only veteran warriors that have come through numerous battles are able to evolve, so its existence is already becoming a legend. Not only did its evolution grant it wings, but it also evolved several parts of its body for better grappling, acquiring stronger offensive and defensive power. 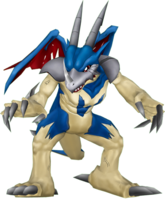 If you include its attacks from the sky, there are probably no longer any opponents who can rival Aero V-dramon. 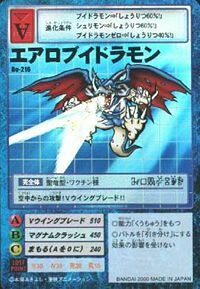 Its Special Moves are forming a V-shaped energy substance that seems to connect the horn on its snout to the edges of its wings, then soaring towards the opponent (V-Wing Blade), and launching a shock wave which has the appearance of a dragon (Dragon Impulse). Although "V Wing Blade" is a technique that cuts the opponent to pieces with the blades of its wings, its weakness is that it cannot be used if it is not in flight. 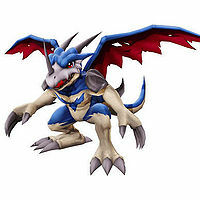 Among the few V-dramon that exist in the world, only the toughest that win countless battles can evolve into this form. With its high-level offense/defense, as well as its added ability to attack from the skies, it's said to be unbeatable. Its Special Move is an upside-down V-shaped energy mass that is shot straight at the enemy, "V Wing Blade". 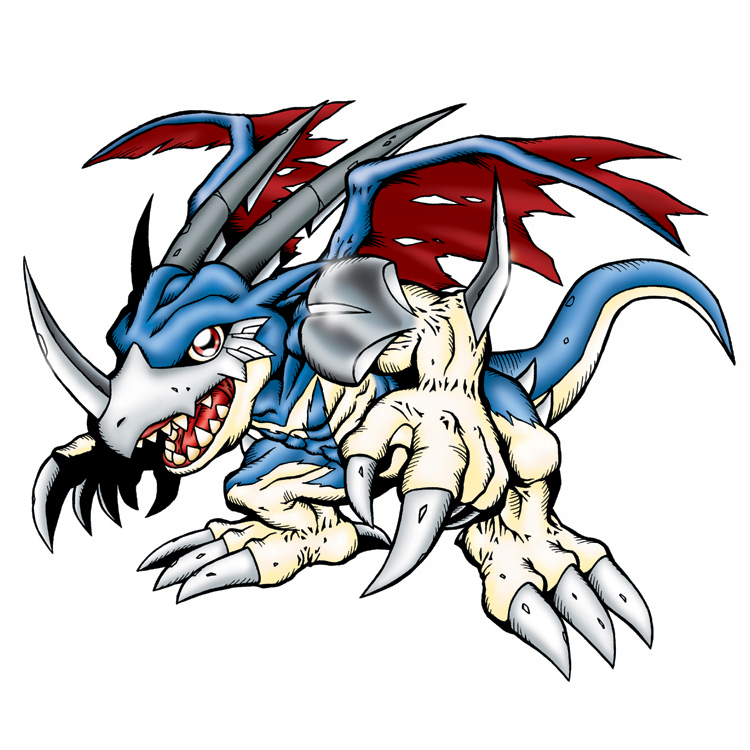 The legendary holy dragon Digimon that evolves from V-dramon after it has won many battles. It grows wings so that it may fly the skies. Its body is evolved for better combat, earning itself high-level offense and defense skills. n., Comes from the Greek word for air. 1) n., Short for Victory. 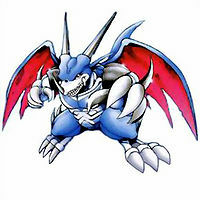 2) n., Something shaped in the form of the letter V, i.e the mark on V-dramon's chest. 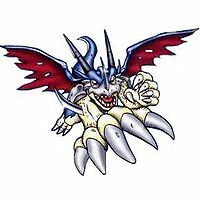 Anime/Manga Digimon Adventure V-Tamer 01: "Butter-fly"
Flies into the air and shoots a blast of heat in the shape of a V one from each wing. Magnum Crash  マグナムクラッシュ Magunamu Kurasshu Magnum Clash/Magnum Crasher Punches foe with fist of glowing energy. Charges up blades on its wrists with energy and slashes at the foe. An attack identical to Twister Saber. Surrounds itself in an aura of energy shaped like a dragon, then fires it at its opponent; it surrounds the foe and explodes. Uses wings to call a flurry of winds that create a wind barrier. V-Breath Arrow  ブイブレスアロー Bui Buresu Arō V-Nova Blast Shoots out a V-shaped heatbeam that burns an enemy into a crisp in a second. An Aero V-dramon by the name of Zeromaru, or Zero, appears with his partner Taichi. 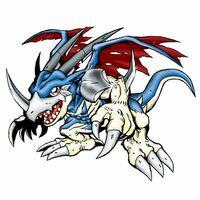 Zeromaru first evolves into this form during a fight with a Deathmon. 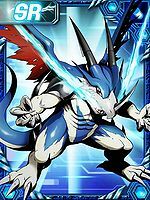 Aero V-Dramon evolves from Airdramon (0+ DP), Fladramon (0-5 DP) or V-dramon (0+ DP). Aero V-Dramon evolves into Hououmon (0+ DP). Aero V-Dramon dwells in MIMD Hole, Noise Hole, Cluster Hole, Bug Bug Hole, Core Tower and Chaos Tower. 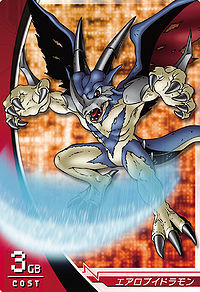 Aero V-dramon evolves from V-dramon. 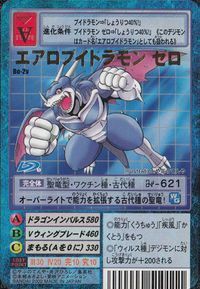 Aero V-dramon appears at Sky City as an opponent with the Slayer deck saying "I'm pretty wild. You'd better watch out, cause you might get hurt!". 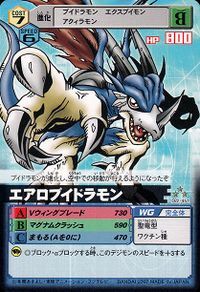 Aero V-dramon also appears as a card of the Nature type. 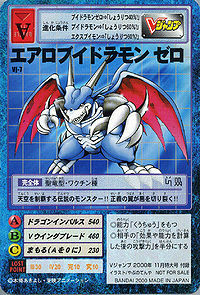 Aero V-dramon evolves from Red V-dramon, and can evolve further into Goddramon. Virus and Vaccine versions of Aero V-dramon also appear in this game. The Virus version is darker in colour whereas the Vaccine version has a yellow tint. 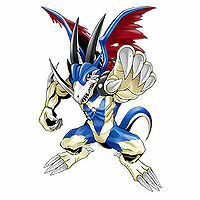 Aero V-dramon evolves from V-dramon, and evolves into Goddramon. 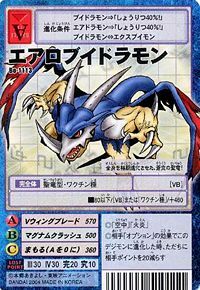 Aero V-dramon can also be obtained by Jogressing Airdramon and Tyranomon, and Jogress with Zudomon or Tylomon to make Plesiomon. Aero V-dramon dwells in Task Canyon. Aero V-dramon is the partner of Shinomiya Rina. 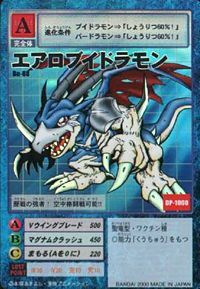 It is also an obtainable Digimon which is evolved from V-dramon, XV-mon or Seadramon, and can evolve to Ulforce V-dramon. It can also be obtained as a collectible card. 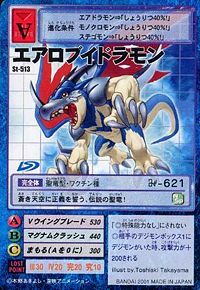 Its card is part of the V-dramon Evolution (ブイドラモン進化 Buidoramon Shinka) set. 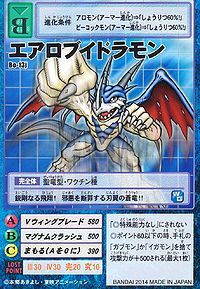 Aero V-dramon evolves from V-dramon or Birdramon and evolves into Hououmon. 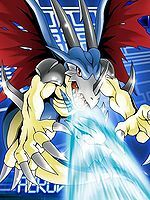 Aero V-dramon evolves from Greymon, Tyranomon, V-dramon, XV-mon, Growmon or Airdramon. 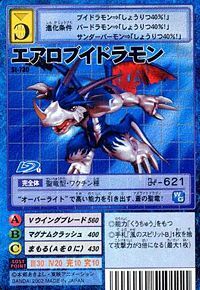 Can evolve to War Greymon, Chaosdramon, Megidramon, Dukemon or Ulforce V-dramon. 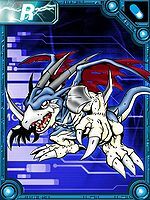 Aero V-dramon is a playable Digimon. This holy dragon of legends pledges justice to the blue skies! It draws out its high abilities through "Overwrite", the azurite dragon! A warrior with a long battle history! It is capable of aerial battles!! An attack from the sky! V-Wing Blade!! Bluer than the blue sky, it draws the seal of the champion in the heavens!! This supreme dragon tears up the stratosphere and reigns over the skies! This holy dragon of the blue sky upgraded its whole body for combat! A strong, sharp flight! A wing-bladed blue dragon passes judgment upon evil!! A holy dragon of an ancient species who overwrites the limits of its abilities! The legendary monster dominates the skies!! Its wings of justice tear evil to pieces!! V-dramon has evolved so that it can move through the sky! 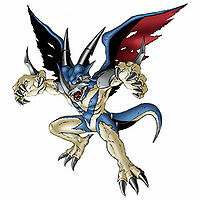 A legendary Digimon that evolved from the rare species V-dramon, after an individual has fought through countless battles. It has gained flight abilities, a tough hide, as well as sharp horns and claws, all contributing to its high combat abilities. 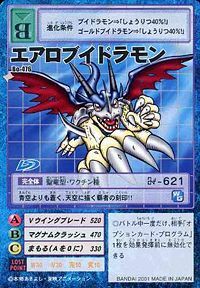 ↑ Digimon Adventure V-Tamer 01: "Mighty Wing"
↑ ウィンドガーディアン is displayed as the furigana above the Japanese expression for "Guardian Wall of Wind" (風の守護壁 Kaze no Shugo Kabe). This page was last modified on 23 August 2018, at 15:57.